I just got back into New York after a beautiful weekend with my family in Ohio. I had a voice over job there, so lucky me, I got to spend the weekend with my family! 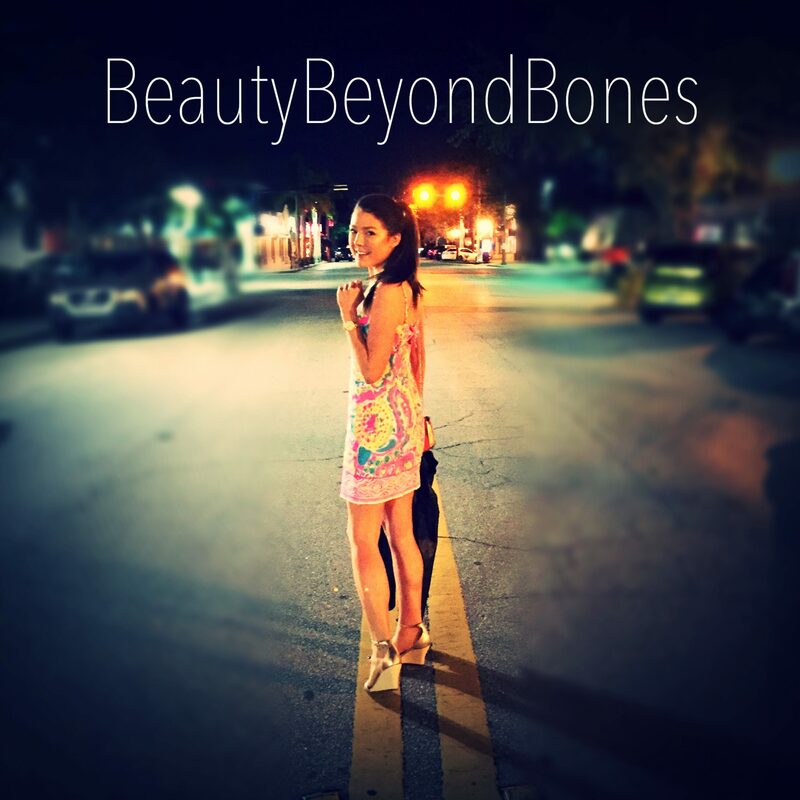 To catch those of you up who may have just stumbled onto this blog, I follow the therapeutic diet, the SCD, to keep my Ulcerative Colitis in remission. After a year of bed rest from a horrendous UC flare, I adopted the Specific Carb Diet, and it healed my disease, and kept me in remission for the last 7 years! SO! What did I create? 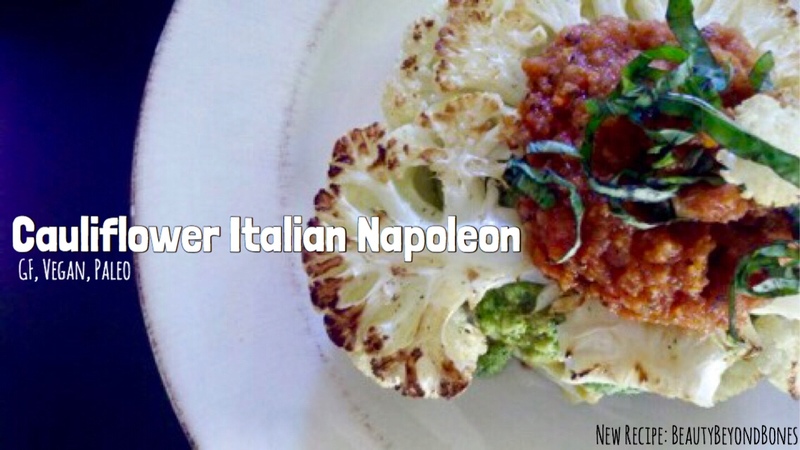 This beautiful dish is my Cauliflower Italian Napoleon! Oh my gosh, it was outrageously delicious. It’s going to become a dinner staple for sure! Golden brown layers of cauliflower steaks, sandwiching creamy pesto and rustic tomato sauce! And it’s Gluten Free, Grain Free, Vegan, and Specific Carb Diet friendly! Preheat oven to 400 degrees. Cut the cauliflower into 1 inch “steaks”, being sure to keep the stalk attached, so as to keep the florets together. Place the cauliflower “steaks” on a tinfoil-lined, olive oil-strayed baking sheet. Spritz or rub them with olive oil, sprinkle with salt and pepper, and bake for 35-40 minutes, until golden brown, flipping half way through. After you finish the pesto, put it into a bowl, and reassemble the food processor – you’ll use it again, but you don’t need to wash it yet. On the stove, saute the onion in 1 Tbsp EVOO with salt, pepper, dried oregano and basil. Add your carrot, and let it soften, about 6 minutes. Finally, add in your tomatoes and garlic. Let them cook for about 3 minutes. Put it in the food processor, and pulse until it creates your desired consistency. To assemble, place one cauliflower “steak” on the plate and top with about 1/4 – 1/2 cup of the broccoli pesto. Place another steak on top of the pesto, top with about 1/4 – 1/2 cup of the marinara sauce, and garnish with fresh basil. This meal was immensely enjoyable! Everything about it was just wonderful – the flavors, the textures, and the aesthetics! Real Italian comfort food, with an SCD twist! First, the flavors were out of this world! If you’ve never roasted cauliflower before, I highly suggest t. It becomes wonderfully golden brown and nutty flavored! It is the perfect canvas for the fresh pesto and sweet-tomatoey marinara! The pesto was bright from the basil, with a subtle garlic note, which was lovely with the fabulous tomato sauce. And the texture of the cauliflower was superbly chewy! That tender-crispness was complimented beautifully by the rich and creamy pesto, and juicy-fresh marinara. Finally, it was a delight for the eyes! Red, White and Green — Just like the Italian flag! Next Post Utah, Here We Come! Sounds delish! Thanks for sharing this. Maybe I’ll try it this weekend. That looks delicious! Shout out to all the Celiacs out there–gluten free is the way to be! God bless sister–I can see the Holy Spirit shining in your eyes! Congrats on the food, the podcast, and your future ventures. Have a great week. Ummm, cauliflower newbie here… which way does one slice a cauliflower so as not to lose the florets?? I can see getting two (maybe 3) vertical slices from the middle, then what? I’m going to have to remember to eat supper before I read your Wednesday posts! 😉 Making my mouth water. Always good. Oh, yeah. Can’t beat a good Hallmark Movie. 🙂 Have a good rest of your week! This looks amazing, Carolyn. You always seem to create such amazing dishes. Yum. I’ll have to try this on Saturday. And I agree with Kenneth. I should have eaten before reading this! Have a wonderful rest of your week. Happy Birthday to you and your mom, Caralyn! God loves you both! Happy Birthday. The recipe looks and sounds awesome. Thank you. Happy Birthday! Your recipe looks awesome! Can’t wait to try it, thank you. I wnat to try this 🙂 thank you for sharing. thanks Shane! it was pretty yummy! Caralyn! I made this delightful recipe the other evening for my Cuppycake & I and all I can say is YUMMMMMMMMMM! This is definitely going in to my recipe collection!! Hugs to you for sharing it with all of us! I only wish I could attach the photo I took to share with you!! I will look to do so!